It’s hugely important for schools and businesses to monitor who comes in and who goes out of their premises, in case of fire alarms as well as security reasons. InVentry’s visitor management system allows you to simplify and speed up the process of visitor and staff sign-in. By digitising the registration process, the visitor management system becomes a far simpler and faster task to collate student attendance records or to identify if a particular member of staff is currently on premise, reducing administration time. Should there be any need to evacuate the building, a list of all personnel on-site can quickly be produced. The simple touchscreen sign-in process allows staff, students and visitors to sign in using an existing ID card, or by choosing their name and photo on-screen in order to register their attendance for the day. It also allows visitors to register their arrival, print off a temporary ID pass, and notify the person they have come to see, all within a couple of taps. How is InVentry better than paper-based sign-in solutions? InVentry provides schools and organisations with a securely-encrypted central database of individuals who have been in the building, and are currently in the building, including digital timestamps of their arrival and departure times, car registration and photograph. This information can be easily and quickly archived, searched and collated for simplification of registration or attendance records, or for future audit, whereas conducting these administration tasks using paper-based sign-in is a time-consuming process. How will InVentry integrate into our current systems (including SIMS)? InVentry is a fully standalone system and can function without any additional software, however it is also compatible with many leading Management Information Systems. The system is also capable of communicating within your existing channels, by sending a text message or email to announce the arrival of a visitor to the appropriate member of staff, along with a photo so they know who to expect - facilitating a professional greeting. 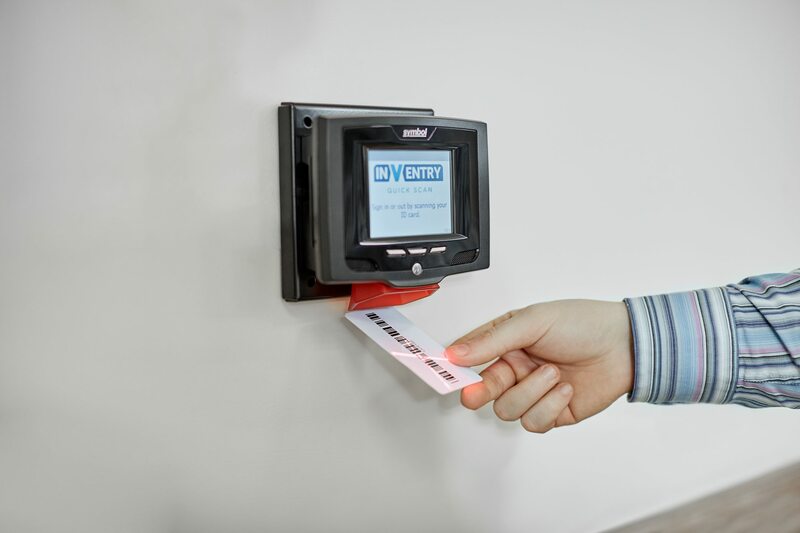 Additionally, the system is compatible with barcode and RFID-enabled swipe cards and fobs using Paxton, MiFare or HID systems, so no need to replace existing ID and security measures. InVentry is also compatible with SIMS and Classmark information systems to quickly and accurately create digital records of attendance. Can InVentry conduct DBS checks? 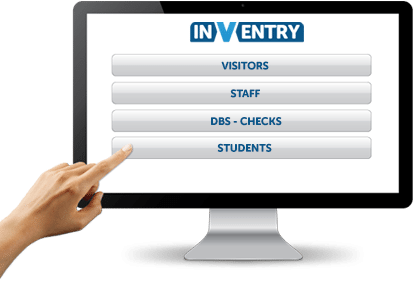 Yes - InVentry systems can be used as a central hub of information for recruitment and vetting checks for staff and visitors thanks to its DBS integration. Can InVentry be used to create emergency evacuation lists? Yes - it's possible to quickly call up and print a record of everyone who is present in the building in the case of fire or emergency evacuation, allowing an accurate roll call to be conducted. How do temporary passes work? Passes are printed using a thermal label printer on special sticky-backed paper - no ink required. The passes are printed with a barcode which will allow users to sign out again using their temporary pass on the integrated reader. Inventry’s MIS-compatible touch screen system allows you to accurately monitor who’s in your school or company premises at any time, whether that be staff, students, teachers, visitors or contractors. InVentry’s simple, touch-based interface makes sign-in fast and effortless, and the powerful back-end systems make auditing attendance, entry times and on-premise personnel simple. If your school or organisation is already using barcode or RFID-based card technologies for ID, access and authentication, these cards are compatible with InVentry readers out of the box. This means that integrating InVentry into your existing architecture is smooth and simple, and signing in is a fast, responsive process that won’t cause any user inconvenience. This brief video will describe how schools use and benefit from InVentry Visitor Management solutions – click the play button on the image to view. InVentry display units have a built-in webcam, which has some useful dual functionality. Not only does it send a snapshot of the visitor via email to the person they are visiting, so that they can recognise them in the event they have not met previously, but the image is saved in the database so administrators can put “name to face” when auditing who is on site. 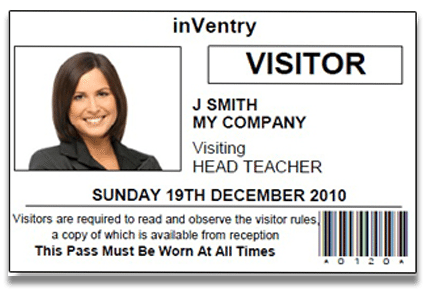 For contractors, short-term temporary staff and visitors, InVentry systems can be connected to any compatible thermal label printer to issue a temporary pass. The pass displays their name, photo from the built-in webcam, who they are visiting and on what date. The pass can be used to sign out at the end of the visit, using the printed barcode.